Despite a setback for logging interests, we are not out of the woods yet. Australia's ancient native forests were saved the ignominy of being incinerated for government-subsidised electricity by the unlikeliest of candidates this week. Liberal defector and House of Representatives Speaker Peter Slipper used his first deciding vote to defeat independent MP Rob Oakeshott's motion for native forest biomass to be classed as renewable energy. It was the latest in a series of bids by the financially unviable native forest logging industry to stay alive despite massively changed community expectations. But the closeness of the vote suggests native forests won't be out of the woods until the industry embraces a sustainable future. In 200 years Australia has cleared and logged much of its old growth and wild forests so it can only be misguided to burn the rest. The embrace of the seemingly innocuous-sounding biomass energy is a ''scorched earth'' policy of an industry in hasty retreat. Late last year the Australian government announced its intention to remove renewable energy subsidies from projects that sought to use native forest ''waste'', including 400-year-old trees, in so-called renewable energy furnaces to generate electricity. This proposal would have been hilarious if not so serious, but there is a precedent for this desperate play. In the 1960s and '70s, export wood chipping of native forests became entrenched. Export wood chipping was portrayed to sceptical Australians as a sensible way of finding a market for those parts of a logged tree that could not be processed by a sawmill. But within a few years wood chipping became the only economic reason for logging native forests. By the 1990s, millions of tonnes per year of native forest woodchips were exported as sawmills quietly closed across the country. Now, with changing market expectations, the world has lost its taste for woodchips from Australia's ancient forests. For evidence of the collapsing wood chip market, one needs to look no further than the mound of chips that piled up at the Artec mill at Bell Bay in Tasmania, a pile so large that the mill suspended operations last month because it had run out of storage space until it found a buyer this week. Developments over the past few years have demonstrated clearly that without income from export wood chipping, the native forest timber industry is not financially viable. Even with wood chipping, the industry has relied on government subsidies for more than a decade. Last year, the state's auditor-general warned that Forestry Tasmania needed a cash injection of $250 million to remain solvent. The industry is in crisis. It desperately needs a new income stream to survive. Enter Rob Oakeshott and his friends from the timber industry who claim energy generated from burning native forests is renewable. Clearly, properly managed timber plantations are a renewable resource, but wood sourced from native forest logging is something else. It can take hundreds of years for these trees to grow to the size of 30-storey buildings, and a matter of minutes for them to burn. In the meantime, it will take decades for the resulting carbon dioxide to be sucked out of the atmosphere. A recent North American study found that producing power from burning native forests was more carbon intensive than using fossil fuel in 80 per cent of the regions studied. The situation would be worse in Australia, which has the most carbon-dense forests in the world. The native forest industry has been on life support for long enough, yet governments and their rogue forestry agencies continue to draw out its death, subsidising the industry and leaving the taxpayer open to pay out contracts that can't be met. Forests NSW had to pay Boral half a million dollars in 2006 because it couldn't supply contracts from 2002. Bizarrely, it signed new wood supply agreements in 2004, and last year Boral took Forests NSW to court again seeking a further $1 million. 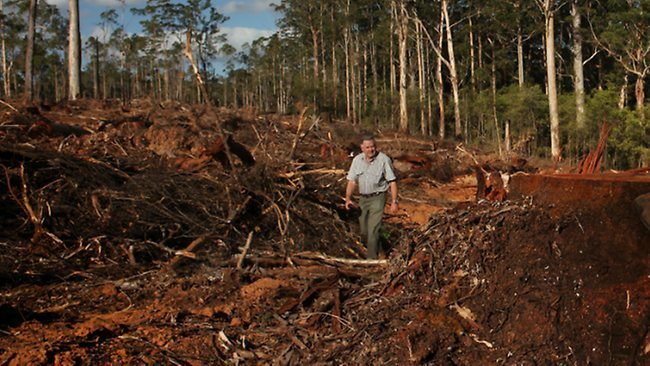 Forests NSW lost $14 million in 2008-09, $16 million in 2009-10 and $232 million in 2010-11. The Western Australian government is setting up taxpayers for huge compensation payments in its pursuit to lock in 10-year contracts of 800,000 cubic metres of wood. Similarly, the Victorian government is trying to lock in 20-year supply contracts for native forest ''waste''. To aid this it is planning to exempt logging from the Flora and Fauna Guarantee Act so the habitat of the remaining 1000 or so Leadbeater's possums in the Central Highlands can be logged. The government will risk the extinction of threatened species and what little is left of its old-growth forest to keep the industry going. The Oakeshott plan aimed to throw another desperate low-value, high-volume lifeline to this dying industry. Burning native forests is not renewable and the reasons for its promotion have nothing to do with climate change. Lyndon Schneiders is national director of The Wilderness Society. WHEN Neil Bartholomaeus headed south from the Perth suburb of Nedlands to chase trout in the clear mountain streams near Manjimup, he could not have imagined the decades he would spend fighting the destruction of his new-found home. Just as fashion designer Prue Acton could not have foreseen the battle she has been forced to wage for the forests of southeast NSW. Bartholomaeus and Acton both timed their escape to the bush as the native forest industry made its transition from selective logging to broadscale clear-felling to feed a global demand for woodchips. "Every time I drive around the forest it has changed," Bartholomaeus says. "They take everything. Hundreds of thousands of tonnes of old-growth marri and karri has ended up in the chip mill." Opposition to logging by affluent city refugees has always been a nuisance to those who rely on timber for their livelihood. Jobs in the bush have been few and far between, whether in Eden in NSW or Manjimup in Western Australia. But despite dramatically increasing the forest take, three decades of exporting woodchips has not been enough to save the industry from falling prices, reduced demand and growing competition from plantation timber. A preference by builders for softwood pine and heightened consumer resistance to native forest woodchips have combined with a rising Australian dollar to leave the industry struggling for survival. In WA, giant Karri trees, up to 90m tall and measuring 2m across, are still being clear-felled and sold for firewood or chips for as little as $10 a tonne. The forest industry says 90 per cent of Australia's timber production occurs in regrowth forests resulting from previous logging. But what it doesn't say is that, at least in WA, evidence of just one cut tree in a hectare of forest is enough to disqualify the forest as old growth and redefine it as regrowth, no matter the quality of what is left. 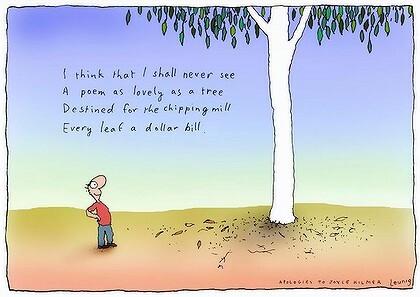 This is why forest giants, hundreds of years old, are still being clear-felled at Manjimup as "waste" for the chip mill. It has been economics and concerns from buyers that has slowed woodchipping, not good forest management. Nationally, native forest pulp production has fallen from 7.1 million cubic metres a year in 2000 to 3.6 million cubic metres a year in 2010. It has been substituted by hardwood plantation pulp rising from 0.7 million cubic metres a year to 4.2 million cubic metres a year in the same period. Sawn timber production from native forest has fallen 35 per cent from 2000 to 2010 while plantation softwood has increased 30 per cent. Sawn timber production from plantation in 2010 was more than three times the volume produced from native forests. Financial returns to state governments from forest management have been abysmal. Forest campaigners such as Bartholomaeus and Acton had hoped economic reality would eventually see the native forest industry collapse. But manoeuvrings in federal parliament this week highlight the delicate balance that still exists between protecting timber industry jobs and and saving the centuries-old trees. Independent MP Rob Oakeshott stunned his Labor and Greens colleagues when he lodged a disallowance motion to unpick the agreed renewable energy package that specifically excluded native forests. Speaker Peter Slipper used his casting vote yesterday to defeat a motion by Oakeshott that would have seen electricity users paying a subsidy to the timber industry to burn the forest for bio-energy, after the vote on the floor of parliament was tied 70 to 70. Wilderness Society national campaign director Lyndon Schneiders says defeat of the motion should finally convince the native forest-based timber industry to restructure, rather than looking for quick fixes to long-term decline. "The native forest logging industry has for years kept spruiking this bizarre notion that burning old-growth forests and koala habitat is somehow renewable energy, in a desperate last roll of the dice to find a market," he says. "The defeat of Rob Oakeshott's motion means that government incentives won't drive this destructive, polluting industry." Oakeshott had said his proposal would not result in one additional tree being cut down, because only forest waste would be eligible. But environment groups say he was being naive at best. They say the recent surge in biomass advocacy is designed to find a replacement market for native forest woodchips. Scientists both for and against petitioned federal politicians to influence their vote. 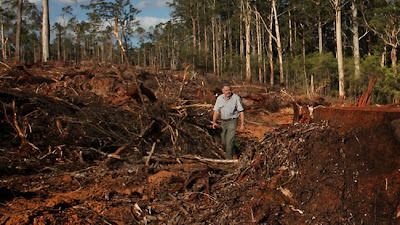 A petition signed by forest industry scientists in favour of the Oakeshott disallowance motion suggested the concerns of environmentalists were misplaced, because only forest waste would be burned for biomass fuel. They say harvesting native forests solely for renewable energy is neither economically attractive nor the best use for the timber. The scientists say sawlogs earn a far greater return for the land manager when used to produce structural or appearance-grade products than if sold as biomass fuel. The letter, written by Martin Moroni, senior research scientist with Forestry Tasmania, and signed by forestry scientists from across the nation, encouraged Oakeshott to push ahead. It said production of biomass fuel from native forests would likely be associated with the burning of processing residues and some harvest residues to generate heat and electricity in boilers located in rural communities, close to mills. According to world bio-energy association board member Andrew Lang, even Renewable Energy Certificates would not be sufficient to make biomass from forests a profitable, standalone business. He says the value of RECs and the wholesale price of electricity combined needed to allow a return on capital for a biomass plant was in excess of $110 a megawatt hour. At present RECs are trading for about $30 a MW hour and the wholesale price for electricity is between $30 and $40 a MW hour, so the price of RECs would have to almost double before a biomass plant would be viable. "There is a long way to go before any power company decides to build a large biomass-fuelled plant," Lang says. But everybody in the renewable energy business expects the REC price to increase sharply if the federal government is to have any hope of meeting its 20 per cent renewable energy target by 2020. Conservationists say there is little coincidence that the areas most interested in dabbling with bio-energy are the existing export woodchip mills in NSW and WA. The Eden mill, which takes forest logs from southeast NSW and Victoria, is already experimenting with power generation from wood pellets made from sawdust. The Manjimup bio-energy plant has permission to burn plantation timber residue, but the project has been relocated to the Diamond native forest mill far away from any plantation resource. According to the Wilderness Society, rather than easing back on loss-making forestry, the WA and Victorian governments are pursuing a model that draws increasingly large volumes of timber from over-cut forests that are in ecological crisis. Both governments have identified native forest biomass as a significant, undeveloped market. "Such an approach will only delay the inevitable industry collapse as markets and yields decline, and leave taxpayers to pay contract compensation," the Wilderness Society says. Conservation groups do not believe assurances from Oakeshott and the forest industry that it would only burn "waste" product. They say it is identical to the rationale for export woodchipping, which expanded rapidly from the late 1960s and early 70s, and became the driver of native forest logging. Waste commonly refers to standing trees that are not useable for other commodity timber products. In many cases, "waste" trees constitute the majority of timber removed from the forest. For example, the Victorian government at present is offering for sale timber in East Gippsland at the ratio of one sawlog to 7.6 "residual" or "waste" logs that can be used for pulp or biomass. In WA, "waste" logs can be 400-year-old marri trees that are critical habitat for a range of threatened species. As a percentage of total wood taken from native forests, the sawn timber output represents less than 12 per cent of total wood removals. The reality is the woodchip tail has long been wagging the forest dog. According to Acton, woodchipping for the Eden mill started in the 70s with a projected 5000 tonnes a year for five years, but is now regularly topping a million tonnes a year, more than 90 per cent of the forest harvest. With the woodchip market under pressure, Eden woodchip mill general manager Peter Mitchell says he would be quite happy to burn native forests for electricity but the numbers simply don't add up -- at the moment. "If we start to bring trees in here to chip and turn into electricity we may as well just burn $100," he says. "It costs us about $70 a tonne to get a tree in here, and we can only afford to pay $15 (for it to be financially viable)." Environmentalists fear RECs could eventually bridge that gap. Acton says she is not a member of the Greens and does not object to a forest industry based on the use of high-value timber for furniture and building products. She is also sympathetic to arguments about regional employment. 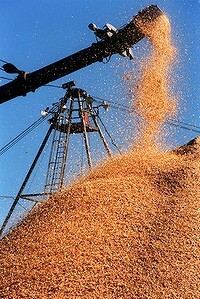 In southern NSW, the industry employs about 340 people in sawmills, as contractors and at the Eden chip mill. Acton says it makes more sense to build tourism and for the state to buy out forest licences and instead sell carbon credits against the avoided deforestation. Oakeshott's motion has once more shown how Australian forests are at the crossroads. The challenge for conservationists is to make trees more profitable alive than dead. Should they be left standing for posterity, or should they go up in smoke for short-term prosperity? Federal Independent MP Rob Oakeshott's bid to introduce an amendment allowing wastes from forestry to be used in biomass projects lead to a House vote locked at 70-70 before the Speaker added his vote to reject the move. Ballarat-based board member for the World Bioenergy Association Andrew Lang says this is a colossal lost opportunity and that the bioenergy industry has been 'hijacked' as Australia move towards a carbon-taxed economy. A defeat by the narrowest of margins in the Federal Parliament for a vote to allow biomass projects to be fuelled by forest waste is being declared a victory for 'scare campaigners and fundamentalists' by one of Australia's pre-eminent advocates for biomass energy production. "It's just a really unfortunate thing, that this has hijacked the debate about bioenergy more broadly. "The biomass or the harvest residues or the timber industry processing residues that are involved in native forestry are always going to be a very small part of the total available biomass that goes into producing baseload energy, whether it's from straw or municipal waste or plantation harvest waste - it's a distraction in the whole debate and unfortunately it's held up the entire debate," says Ballarat-based campaigner for bioenergy and board member for the World Bioenergy Association, Andrew Lang. Bioenergy projects are essentially renewable energy projects using power derived from biological sources, but one particular method involves burning organic products in an incinerator to generate electricity - straw, greenwaste, sugarcane, and the cause of the tensions with Green groups in Australia - forest waste. Rob Oakeshott's proposal allowed for forest wastes to be eligible for carbon credits when used in biomass projects. "It is therefore a surprise that today the Labor Party is choosing to ignore new Senator Bob Carr on the issue of renewable energy and to make it harder for biomass, as a genuine renewable source, to be a contributor to the climate change challenge of our time. Over the last month there has been a war of scientists - views have been cited both for and against this disallowance motion. "But today the chairman of the Centre of Excellence for Climate Change, Woodland and Forest Health has come out publicly and said that the position I am taking should be supported. If Senator Bob Carr is not good enough, what about the chairman of the Centre of Excellence for Climate Change, Woodland and Forest Health? Why would we deny his voice and why would we deny the centre of excellence in developing best policy?" Andrew Lang reaffirms that the issue of forest waste being used in biomass has been characterised as 'burning forests' when the truth is it is about using the litter and waste left over by forestry operations. "The Greens and allied groups have made it out to be a very alarmist agenda that the native forestry industry might have. "It's just a matter of how you use this material, do you leave it to rot on site or do you utilise it to offset use of fossil fuels?" Mr Lang has been advocating and planning for a biomass energy generator facility in Ballarat - does this he see this rejection by the Australian Parliament as destroying any chances of developing a local bioemergy industry, with applications for local energy production? "It doesn't rule out the rest of the industry but it puts a different mindset into the heads of the politicians, and possibly the public and some areas of the media. "Some people think bioemergy is bad when the only thing they hear of it is this vilification of it by green groups - when in reality bioenergy is three quarters of our energy anyway in one way or another," he says. Andrew Lang says the effects by policy inaction are easily seen around regional Australia - farmers burning their stubble, forestry companies burning the waste left over by felling operations - but the focus has been unfairly shifted onto native forest logging operations. "We're trying to push the use of plantation harvest waste and we're trying to push the use of straw but all around us the countryside is going up in smoke because of the want of any other policies; and the whole concentration on native forest harvest residue and the residue from every sawmill that might mill native forest logs being able to be eligible for renewable energy cresdits is a complete distraction in the whole thing. "If it's managed right, if it's regulated right at the State level, not a single extra tree would be felled if that legislation had gone through - if native forestry biomass had been joined in with all other forms of biomass as eligible." Forest campaigners say a failed bid to subsidise the burning of forest waste will protect Western Australia's forests from more logging. A motion by independent MP Rob Oakeshott called for valuable renewable energy certificates for electricity generated from state forest waste. The motion was rejected in Federal Parliament yesterday. A spokeswoman for the WA Forest Alliance, Jess Beckerling, says it is a win for forests around the country. "It's a really strong indication that common sense has prevailed," she said. "It was a very, very close vote but what it's shown is that people are really concerned about the destruction of native forest, particularly when that destruction is for such low value products." Ms Beckerling says the result will protect Australian forests from an increase in logging. "[It's a] wonderful result for forests and wildlife in WA and also around Australia," she said. "Huge, enormous old karri trees and marri trees would have been fed into the furnaces. "So it's a fantastic result for the forests that that won't be happening." A CONTROVERSIAL push by crossbench MP Rob Oakeshott to allow forestry companies to earn renewable energy subsidies by burning native forest wood looks set to be shot down, with fellow independent Tony Windsor refusing to back the deal. Mr Oakeshott's move, which infuriated the Greens and sparked a vigorous environmental campaign, appears likely to fall short of a majority when it goes to the Parliament this week, mostly likely today. A regulation created under the government's carbon tax deal with the Greens and independents has banned loggers from earning renewable energy certificates — which can be sold for cash — by burning native forest wood to make electricity. Mr Oakeshott's move to disallow that regulation is aimed at waste wood created by timber logging. But green groups argue that it would also throw a financial lifeline to the woodchip industry — which is struggling amid slumping exports — by giving it a new source of revenue. Mr Windsor, who had previously been thought to support the motion, told The Age: "I won't be supporting it in the House." Mr Oakeshott acknowledged that "if everyone turns up, it'll probably lose by one". "But [I'm] still working on it," he added. "There's a whole range of things that can change the dynamic." Mr Oakeshott said biomass such as wood waste was a "genuinely renewable energy". If it were not burnt for electricity, it would either be burnt as waste or decay naturally, emitting carbon anyway, he said. "It has been a disgraceful campaign by GetUp!, the [Australian Youth Climate Coalition] and the Greens," he said. But the Greens argue Mr Oakeshott's motion would just encourage more logging of native forests by giving the woodchip industry a new economic incentive. "We are working extremely hard to make sure that this tightening of the rules around renewable energy stands," said the party's deputy leader Christine Milne. VicForests has been accused of logging protected rainforests. The court battle relates to VicForests' logging operations in the Orbost Forest District in East Gippsland, where the Victorian Department of Sustainability and Environment says unauthorised harvesting of rainforest and buffer areas took place. A spokeswoman for the department confirmed the prosecution, saying charges laid on VicForests included "undertaking an unauthorised timber harvesting operation in a state forest". VicForests has also been charged with directing its contractor to log rainforest against timber harvesting licence conditions. VicForests spokesman David Walsh said the timber agency would defend itself against the allegations. "The charges relate to harvesting operations in East Gippsland," he said. "VicForests intends to strongly defend itself in relation to this matter." If found guilty, VicForests faces a maximum penalty of $29,000. A directions hearing will be held in the Orbost Magistrates Court on March 29. Agriculture Minister Peter Walsh said: "Like anyone, VicForests is entitled to the presumption of innocence. They are also required, like protesters, to obey Victorian law." The prosecution of VicForests follows the timber agency's win in the Supreme Court last week against green groups trying to stop three logging coupes in part of Victoria's central highlands near Toolangi. Conservationists had argued the coupes threatened habitat of the endangered Leadbeater's Possum, Victoria's faunal emblem. After VicForests' win last week, Mr Walsh accused green groups of costing the government hundreds of thousands of dollars this year in protest management and legal fees in logging cases. Opposition spokesman for government scrutiny Martin Pakula said it was obscene that two government agencies were now fighting each other in court in the Orbost case. "So, Victoria is in deficit by almost $350 million in the last six months, and yet we've got two state government agencies wasting hundreds of thousands of dollars fighting each other in court. It's just obscene," he said. The Wilderness Society's Luke Chamberlain said that in 10 years, less than one in 300 coupes in Victoria had been challenged by environmentalists. "It is hardly a case for government to argue that court cases are stopping logging in Victoria, triggering a need to change Victoria's environment laws in relation to logging," he said. The state government recently released a new plan for the timber industry, which among other things increased VicForests' ability to sign timber contracts to 20 years. The Baillieu government is also proposing changes to the Timber Code, allowing exemptions to be granted from state environment laws for individual logging coupes. It comes as the state environment department decided to halt operations at an education centre in the Toolangi State Forest from July 1. TREES more than 400 years old that grow to 90m and measure 2m across could be fed to the furnace to generate electricity as a result of independent MP Rob Oakeshott's plan to extend renewable energy subsidies to native forests. The Karri trees -- Western Australia's tallest and among the world's tallest -- are already classified as forest waste and turned into woodchips for a market that no longer wants them. For anyone who doubts it, examples of the trees are stacked up at the Diamond chip mill in Manjimup in Western Australia's southwest. Forest campaigner Jess Beckerling said carbon dating had shown that 430-year old trees were being sold as firewood for as little as $9 a tone. "There is no economic rationality in it," Ms Beckerling said. Manjimup is a reflection of was is happening in state forestry nationally as the industry has moved increasingly to plantation timer and the export market for woodchips has collapsed. Mr Oakeshott's proposal to provide a subsidy for burning forest "waste" is considered a potential lifeline for foresters and a new flashpoint for environmentalists around the nation. Long-standing plans for a bio-energy plant in Western Australia's southwest have struggled to get off the ground. The plant has approval to burn residue from plantation timber. But the location for National Power's proposed 45 megawatt power station has been shifted to the Diamond mill site away from blue gum plantations in state forest operations. Mr Oakeshott said his motion would not result in additional logging and rely only on residues now burnt in the field. But environment groups fear extending the renewable energy certificate scheme to include electricity generated from forest waste would be a repeat of the export woodchip experience of the 1970s. It would radically change the economics of producing electricity from the forest and accelerate the clear felling, they claim. Granting valuable renewable energy certificates for electricity generated from state forests was specifically excluded from the federal government's clean energy legislation. But Mr Oakeshott has lodged a disallowance motion to this specific clause in the legislation. If the disallowance motion is not challenged in federal parliament before March 21, the clause will cease to apply and forest timber will automatically qualify for renewable-energy subsidies. Mr Oakeshott has the support of the bio-energy industry, which says a biomass plant would get its main supply from plantation forestry and urban woody biomass and that any native forestry biomass used would be minor. Environment groups reject claims that only waste left behind would be burnt because the legislation is not specific. "Residue is whole logs," Ms Beckerling said. "The idea that they are somehow going to feed a furnace from mill waste is completely ridiculous." Neil Bartholomaeus, a former head of Work Safe Western Australia, said he had seen it all before. He is a marron farmer, trout fisherman, long-time resident and forest campaigner. "You end up with the situation where, effectively, the tail - the residue being burnt for biomass fuel - would be wagging the dog," he said. Manjimup Shire president Wade DeCampo supports Mr Oakeshott's disallowance motion. Local businesses are concerned a bio-energy furnace would threaten the clean food image of an area that produces twice as much as the Ord River scheme. IT IS like a nightmare to witness environmental gains of the past 20 years being chipped away by the Baillieu government as it appeases the Nationals for getting them over the line. MANY East Gippsland communities rely on forestry. Towns such as Bairnsdale, Orbost and Cann River are absolutely reliant on the industry for jobs and, in many cases, their very survival. VicForests is not talking about an increase in the amount of forest harvested for timber production. We're looking at making better use of the very small amount of the forest available to the industry to ensure our rural communities that rely on forestry have a future. A possible outcome from VicForests' tender process could be new engineered high-value wood products. SOONER or later the Baillieu government will need to help train and create lasting, sustainable jobs for the handful of people currently employed to log East Gippsland native forests. If it is done sooner rather than later, the state will not only save a small fortune in taxpayer subsidies, but will give my grandchildren the same opportunity to enjoy the splendour of those beautiful, unique forests that I enjoyed as a child. THE National Parks Association noted at the weekend that Victoria is the most cleared and ecologically stressed state in the country. The Baillieu government's latest plan in its almost daily attacks on what's left of Victoria's natural environment is the proposal to burn our forests for electricity (''East Gippsland timber destined for chips, power'', The Age, 13/3). The rationale is to encourage investment in the native forest industry. Investors should note that as the experience in Tasmania demonstrated, the public doesn't support native forest logging and will not support burning of forests for electricity. There will be no certainty of future government support. It is disappointing that the only vision Ted Baillieu has for Victoria is one in ashes. THE construction of a ''forest waste''-fired power station will cost millions of dollars and require a small full-time workforce to keep it going. An asset of that size will need to be fed constantly to ''maximise the return on investment'' and retain employment. What happens if the fiery furnace ever runs out of ''forest waste'' fuel? Simple. Just cut down some more trees. Any trees; habitat trees, endangered species, young trees, ancient trees - who cares? The power station will not be a ''waste disposal unit'', it will quickly become a business imperative. This is gross environmental vandalism taken to the point of stupidity. Our heritage will just go up in smoke. This proposal needs to go into the furnace. Today. UP TO 90 per cent of timber logged in long-contested east Gippsland native forests over the next two decades could be woodchipped or burnt by electricity companies to generate power, government documents show. The Baillieu government has started a tender process for 837,000 tonnes a year of woodchips and forestry waste, offering contracts of up to 20 years. Of this, tender documents indicate 451,000 tonnes a year could come from mixed species forests in Tambo and east Gippsland — the site of Victoria's most heated disputes between timber workers and environmentalists. But forecasts show that until 2030 the same forests will yield just 50,000 tonnes a year of high-quality sawlog timber used in furniture and construction. Across the state nearly 30 per cent of logged native timber is considered high-quality, but the documents show that in east Gippsland it could be as little as 10 per cent. The rest is considered suitable for woodchipping, conversion into low-value wood products such as chipboard or burning as fuel by a new renewable energy industry. Conservationists said it was evidence that these forests were logged to make cheap goods that could come from timber plantations — or in the case of power generation, other sources altogether. "The government is choosing to put woodchips and biomass [power generation] ahead of Victoria's endangered species," Wilderness Society campaigns manager Luke Chamberlain said. State-owned forestry agency VicForests said east Gippsland remained one of the largest producers of high-quality sawlogs in Australia. VicForests spokesman David Walsh said the amount of high-quality timber available for logging in the region had fallen, in part due to the creation of old-growth reserves, but would increase as forests matured after 2030. "In the short-term, this timber remains vital in supporting local manufacturing and providing much-needed jobs in rural Victoria, as well as reducing our need to import wood products from developing nations," he said. The tender process is a key part of the Baillieu government's promise to encourage investment in the native forestry industry. The Coalition guaranteed the industry's long-term future prior to the 2010 election. By contrast, Labor wanted "peace talks" between the industry, unions and conservationists with a goal of reducing logging. A Saturday Age investigation last month revealed Labor considered shutting down the industry altogether, but ultimately rejected the idea. Some industry leaders warned it was in terminal decline due to a combination of economic, environmental and political pressures. But Victorian Association of Forest Industries chief executive Lisa Marty said native forestry still generated about $150 million a year in east Gippsland, directly supporting about 2000 people. Mr Walsh said the plan to sell logging waste previously left or burnt on the forest floor would "impact on sawlog ratios, but will result in a more efficient use of our forest resources". About 80 per cent of forestry revenue comes from sawlogs. Mr Chamberlain said an efficient industry driven by high-value goods would stop clearfelling forest areas and instead fell only select trees for sawlogs. He said selling logging waste for power generation was effectively "tree mining". A CONSERVATION group fears the Tasmanian forest peace deal will be perversely "devastating" for key threatened species, potentially hastening extinctions. 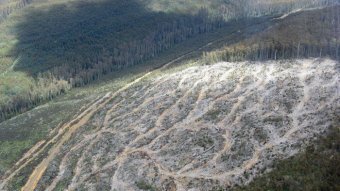 The Tasmanian Conservation Trust is worried about a push to maximise the scale of new forest reserves by relaxing logging practices in the remaining production forests. This trade-off would result in production forests being harvested more intensely, with a weakening of rules in the Forest Practices Code about the retention of forest fragments for threatened species. By increasing the wood volumes from production forests, this would enhance the ability to protect the forests sought by green groups while still honouring timber contracts. The Tasmanian government has suspended planned improvements to the code to allow this trade-off to be on the table at the peace talks between green groups and industry. The TCT, which is not at that table, supports more reserves but not at the expense of weakening the code. TCT director Peter McGlone told The Weekend Australian it would be a "devastating sell-out" if vital protections for threatened species were weakened under the forest deal. This was particularly so given that "very little" threatened species habitat was found in the areas being sought for reservation, while most were found in forests where the code was their only protection. "Masked owl and swift parrot are nationally endangered, old-growth-dependant forest species which will gain very little out of these reserves," Mr McGlone said. This meant the forest deal -- if it reduced the code -- could perversely make things worse for threatened species and drive the swift parrot to extinction. "There will be a big gain for certain values, such as world heritage area and wilderness values, which we totally support, but a massive assault on biodiversity values," Mr McGlone said. "We not just talking about an increasing loss of threatened species habitat, but there will also be massive impacts on water catchments and waterways, with the more intense logging regime." Tasmania's Aboriginal Affairs Minister Cassy O'Connor has apologised to Aborigines for comments claiming Forestry Tasmania was exploiting a vulnerable community. The Tasmanian Aboriginal Centre demanded the public apology saying the comments were patronising and condescending. The centre wants to control more than 500,000 hectares of native forest in a partnership with Forestry Tasmania. It has been in talks with the state-owned company about transferring land protected from logging under the forest peace deal to the Indigenous community. Ms O'Connor had accused Forestry Tasmania of exploiting the vulnerable Aboriginal community. That angered the centre's legal director Michael Mansell. "[It's out of line] to make such patronising and paternalistic and condescending comments about Aboriginal people and then claim to be the Minister representing their interests." Mr Mansell says the proposal would create 60 jobs for Aborigines and the Minister should be representing their interests. He says he was pleased to receive a call from Ms O'Connor but that was not enough. "I did point out to her that I was very happy to accept that, and I appreciated her call, but her comments were made public." "Aborigines around Tasmania heard those comments, were hurt by those comments and she should make a public apology." The Minister has since apologised unreservedly to any member of the Aboriginal community who took offence. She says she was reflecting on Forestry Tasmania's motives rather than members of the Aboriginal community. 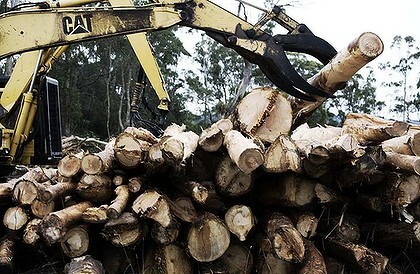 Tasmania's forest industry has backed the plan. The Forestry Industries Association has abandoned the peace talks, but says the idea has merit and needs to be considered. Spokesman Terry Edwards has rejected claims Forestry Tasmania is trying to undermine the peace process. "Forestry would not get any additional access over and above as if these were national parks. "The people that will get access are the people of Tasmania, the recreational users, the people camping and fishing and hunting." One of the parties involved in a proposal also denies it would threaten the state's forest peace deal. The Managing Director of Britton Timbers at Smithton, Glenn Britton, rejects claims it will derail the deal. "This does not jeopardise the IGA (Inter-Governmental Agreement) in any shape or form. The only jeopardy the IGA is in is the radical Green movement." The Wilderness Society's Vica Bayley says Forestry Tasmania is in no position to transfer control of the land. "We're highly suspicious of the role of Forestry Tasmania here." "There is no role for Forestry Tasmania in negotiating Aboriginal land hand back issues and we would recommend the Government get involved and negotiate that directly." Forestry Tasmania has rejected claims it is working to undermine the peace deal. Meanwhile, the Premier, Lara Giddings, has ruled out signing a memorandum of understanding between the two groups. Forestry Tasmania's Bob Gordon says a formal agreement will not proceed without the Premier's approval but talks with the Tasmanian Aboriginal Centre may continue. "When the Premier rang the Chairman she asked us not to sign." "We weren't intending to sign it immediately anyway. We were always intending to have a further discussion with government about it and if Michael Mansell wants to have further discussions with government and he wants us to be involved then we'd be part of that." Tasmanian Premier is appealing to the forest peace deal negotiator, Bill Kelty, to return to Tasmania to help finalise the deal. The former union boss helped the environmental and industry signatories reach the initial agreement to end logging in most public native forests. The signatories now have to agree on the boundaries of protected forest, based on the findings of an independent panel which has assessed 572,000. The Premier, Lara Giddings, is hoping Mr Kelty will return to the state for the most challenging stage of the talks; deciding which forests to protect from logging. She says Mr Kelty is considering the invitation. "[He's] one of Australia's best negotiators. "I've had some preliminary discussions with Bill, I'm just not sure whether or not he's able to do it at this point but I certsainly think that is what we need and that is what the Australian Government wants, it's what the Tasmanian Government wants." The Tasmanian Greens leader wants the Forestry Tasmania board sacked after revelations the state-owned company is negotiating to hand over land marked for protection to Tasmanian Aborigines. The Tasmanian Aboriginal Centre wants areas protected under the federally-funded deal to end logging in native forests handed to Aborigines. The centre's legal director, Michael Mansell, says state-owned Forestry Tasmania has agreed verbally to help manage protected forests, if the Government gives the land to the Aboriginal community. The future of 572,000 hectares of Tasmania forest is currently being considered for protection from logging. Mr Mansell says Aborigines are waiting to see how much is deemed as having high-conservation value. "Once that's agreed, we believe the land should vest in Aboriginal people, the management of the conservation areas vests with us." "The money for the management that has been set aside already by the Commonwealth, $7 million, should go to us and, as part of the management of that large conservation area, we would have to pay the experts. He has drawn up a memorandum of understanding (MOU) with Forestry Tasmania to help manage the forests. He says it is yet to be signed, but the state-owned company and forest groups agree on the principles of the deal. Mr Mansell says the MOU does not allow for future logging inside the protected forests and he expects environmental groups will also sign on. He says it is now up to the Premier, Lara Giddings, to act on the land handover which would also need approval from the Tasmanian Parliament. Ms Giddings says she is aware that the Aboriginal community approached Forestry Tasmania to discuss options to manage new areas of reserves. She says the State Government is not currently considering such a proposal. PHOTO: Michael Mansell expects environmental groups will sign onto the land deal. Greens leader Nick McKim has told ABC Local Radio that Forestry Tasmania was actively undermining the peace process. "That it is actively seeking to undermine the IGA and ultimately what needs to happen now is that Lara Giddings and Bryan Green need to step up to the mark, sack the Forestry Tasmania board, sack Bob Gordon and get that organisation back working in consonance with government policy not opposed to it." Tasmania's Aboriginal Affairs Minister, Cassy O'Connor, is concerned Forestry Tasmania is trying to exploit the Aboriginal community. Ms O'Connor has warned the community it is a mistake to get involved with Forestry Tasmania. "This move, particularly on Forestry Tasmania's part, is a mistake." "Forestry Tasmania is exploiting a vulnerable community, in the process they are potentially undermining the IGA, and as the Minister for Aboriginal Affairs I'm frankly gobsmacked that FT could go to this extent with the community and not consult with the Minister," she said. The Opposition's Peter Gutwein says he is not surprised by the revelations. "This clearly demonstrates the dysfunctional nature of this Government, absolutely." "I don't think there could be a clearer description of this Government as dysfunctional at the moment." 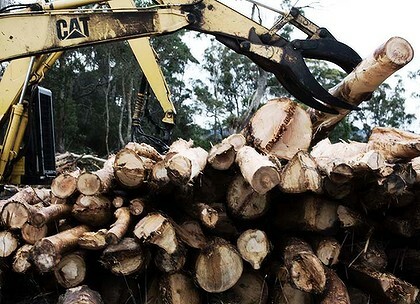 The Australian Greens leader, Bob Brown, says it is a cruel move by Forestry Tasmania. He says the Aboriginal community made him aware of the issue two weeks ago and he has urged them to be wary of the state-owned company. "This is quite a treacherous activity that Forestry Tasmania has been involved in." It is a rogue organisation that sees itself outside the reach of proper probity by the State Government and State Parliament and it's pretty cruel, using the Indigenous community in Tasmania."